The climate-sceptic Global Warming Policy Foundation is to relaunch in September, after a complaint about its charitable status. The Charity Commission has forced it to divide into a charitable educational arm and a separately funded political arm. The change follows a charge that the main purpose of the foundation is political, not charitable. The foundation said its new structure would make it even more effective. It aimed to continue to promote debate about the costs of tackling climate change, it added. But the complainant had argued that its information was often misleading. The Charity Commission investigated the Global Warming Policy Foundation following a complaint by Bob Ward, a science communicator who works with Lord Stern’s climate change team at the LSE. He also complained that the foundation breaches charity rules by “continually disseminating inaccurate and misleading information”. As a consequence of all that brouhaha yet another organisation with an identical acronym was set up. The Global Warming Policy Forum (or GWPF for short). Would it surprise you to learn that the new “political” GWPF is “disseminating inaccurate and misleading information” about the Arctic? If so then please read on. The data used, from MASIE, doesn’t start until 2006. Which makes it downright bizarre to use this for studying climate, for two reasons. First, we have data (passive microwave from satellites) covering quite a bit more time — starting in late 1978. Second, the MASIE people themselves tell you that their product isn’t the best for climate studies, instead you should use that passive microwave data from satellites. Arctic ice declined in the decade prior to 2007, but has not declined since. What we have seen in the last decade is a plateau in Arctic ice extent, analogous to the plateau in surface temperatures. This year end report shows there is no reason to worry about Arctic ice melting. He’s deleting my comments again (and his own comments to wipe out traces of the fact, which is a cowardly act), so I’m just posting the comments here for reference. Ice state in the Peripheral Seas region is a critical metric in determining whether the Arctic Ocean’s ice pack is indeed stabilising or recovering. Nullius in verba, as the GWPF don’t put it. Thanks for your time in our telephone conversation just now. Please do not hesitate to ask if you require any additional information! I wonder whether you have any comments regarding the latest PIOMAS data which appear to show a pause in the Arctic sea ice melt in recent years? To reiterate, as numerous people pointed out to Mr. Clutz following his first article, MASIE is not fit for the purpose to which he (and hence the GWPF) put it. 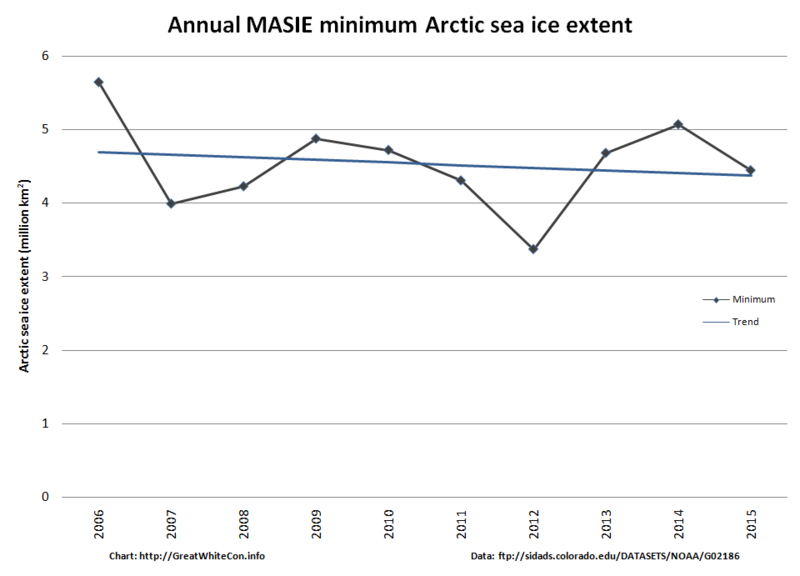 To add insult to injury the first MASIE based graph he (and hence the GWPF) published is wildly inaccurate and misleading, and has still not been corrected. 2. Arctic sea ice has actually decreased since 2007 — contrary to claims that Arctic ice has not declined in the last 8 years. 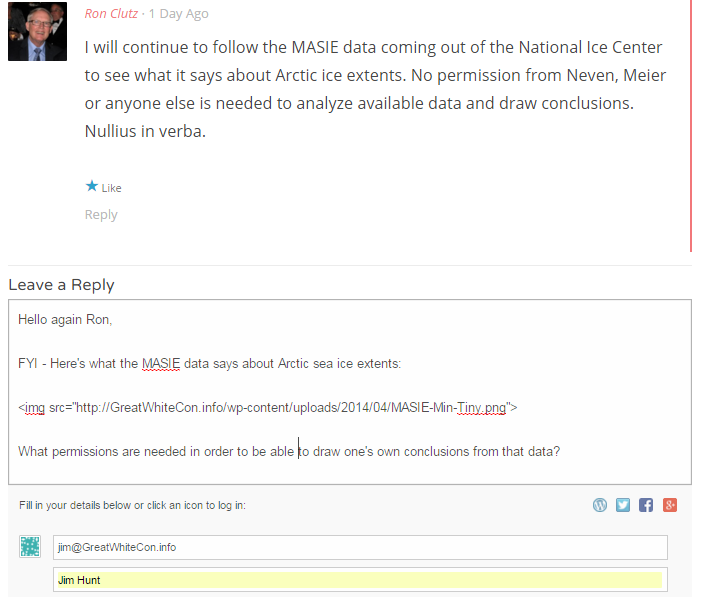 I have looked into your first claim and cannot find any information that undermines the reliability of MASIE data for Arctic sea ice analysis. Regarding your second criticism, the latest PIOMAS data appear to confirm Mr Clutz’s main point, i.e. 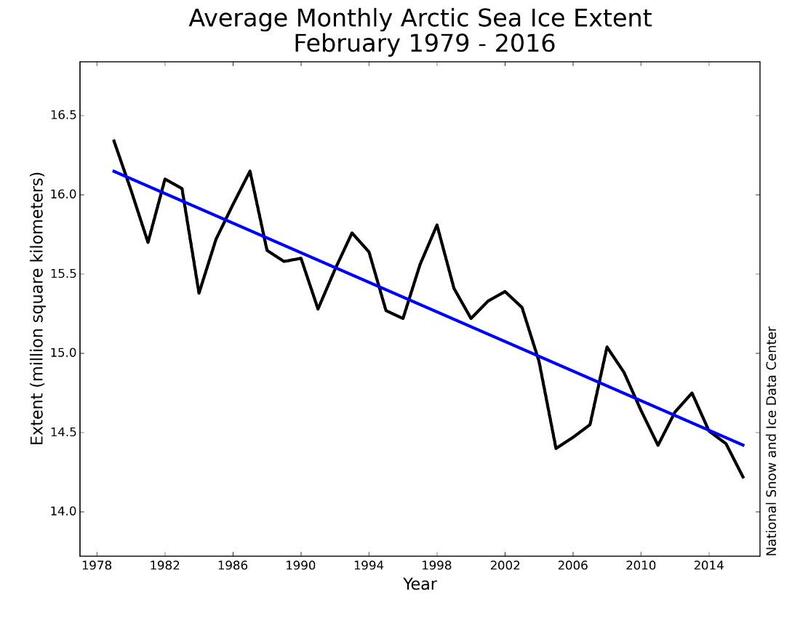 Arctic ice has remained fairly stable since 2007. 1) Did your due diligence include reading this section of the NSIDC web site concerning MASIE? Can you see the parts where it says? MASIE may look like several other sea ice products distributed at NSIDC and elsewhere, but its source data and intended uses are different. Operational ice charts meet the needs of those going into the ice and provide general situational awareness, such as the extent of fast ice or of ice of any concentration greater than zero percent. If one is interested in long-term trends in sea ice or how it responds to changing climate forcing, generally, it is best not to use an operational product, but rather one that is consistently produced and retroactively quality controlled. Do you understand what that means? If not please do not hesitate to ask! 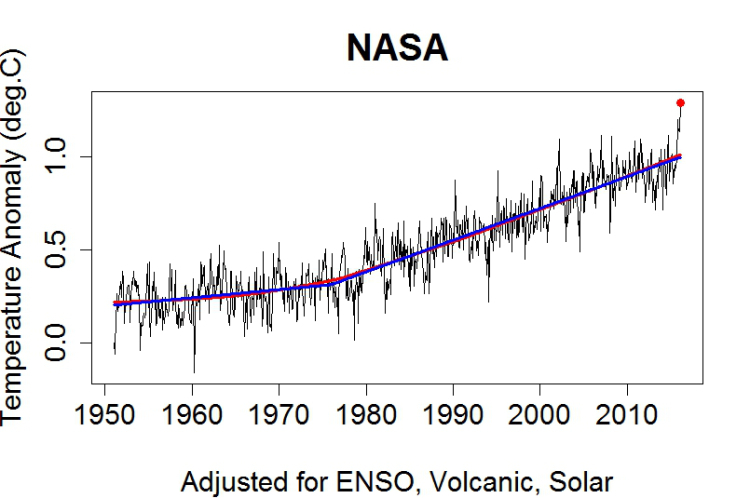 The first MASIE based graph [Ron Clutz] (and hence the GWPF) published is wildly inaccurate and misleading, and has still not been corrected. To see what I mean all you have to do is compare it to the second MASIE based graph [Ron Clutz] (and hence the GWPF) published. I’m afraid you have not addressed my points. There is nothing wrong with the MASIE data, in particular not when it comes to short-term data sets (although I agree that it should not be used for any trend analysis). You did not answer the key question: where is the evidence (as suggested in your graph) that Artic sea ice has declined since 2007? I’m afraid that in actual fact it is you who have not addressed my points. Let me take you through them slowly once again. Once you’ve understood the first two rest assured there are more. 1 a) According to the NSIDC, MASIE is not a “short-term data set”, it is an “operational ice chart”. I’ve received nothing back from you since your email of 15:22 on the 16th. Are you OK? If there’s anything we can do to help please do get in touch. 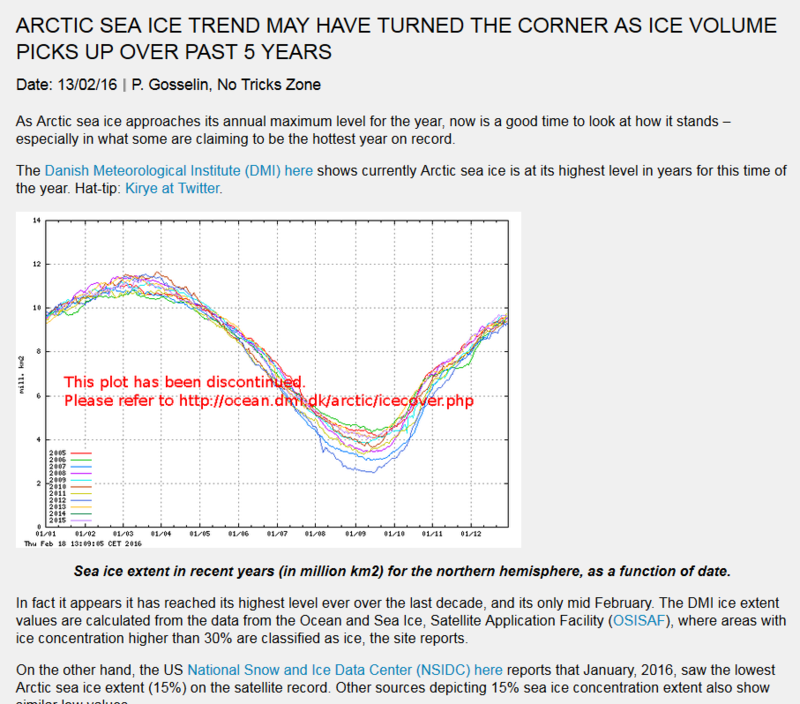 Secondly, are you aware that the February 13th article on the GWPF web site by Pierre Gosselin entitled “Arctic Sea Ice Trend May Have Turned The Corner As Ice Volume Picks Up Over Past 5 Years” currently looks like this? I suggest to monitor global sea ice extent in the next 12 months to see whether the usual recovery fails to materialise (see graph below). I’m delighted to discover that you are evidently in fine fetttle! I am however afraid that your image is invisible at this end, although it appears to emanate from somewhere on the WUWT sea ice page. First of all can you possibly resend it? Secondly I highly recommend that you peruse the GWC sea ice resources instead of Mr. Watts’ in future. I trust that you had a pleasant weekend? 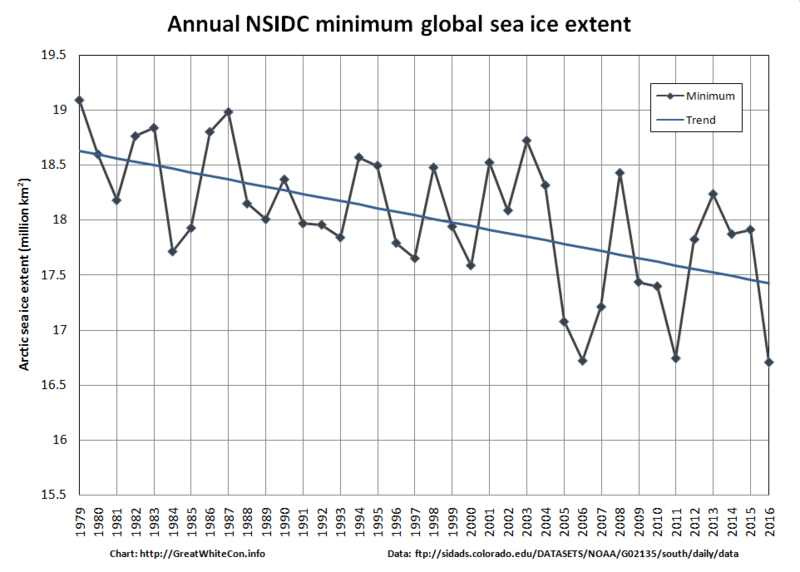 “The Sea Ice Index provides a quick look at Arctic- and Antarctic-wide changes in sea ice. It is a source for consistent, up-to-date sea ice extent and concentration images, in PNG format, and data values, in ASCII text files, from November 1978 to the present. When do you suppose the GWPF webmaster will be able to get around to correcting the latest piece of Arctic misinformation to be published on your web site? Sticking with our own speciality, please feel free to “print” Snow White’s prediction that CT global sea ice area will post yet another new record of around 14.22 million square kilometers over the next 2 to 3 days. Perhaps it is now time to hand your current webmaster their cards and hire a new one? Does Dr. Whitehouse not realise that there was no “pause”? With a new webmaster in charge at The GWPF can we now anticipate an accurate Arctic article appearing on your web site? Please do not hesitate to ask if you would like to republish one of mine. It looks like you’ll have to let another webmaster go, does it not? Don’t forget to tell the new one that my offer of an authoritative Arctic article still stands. 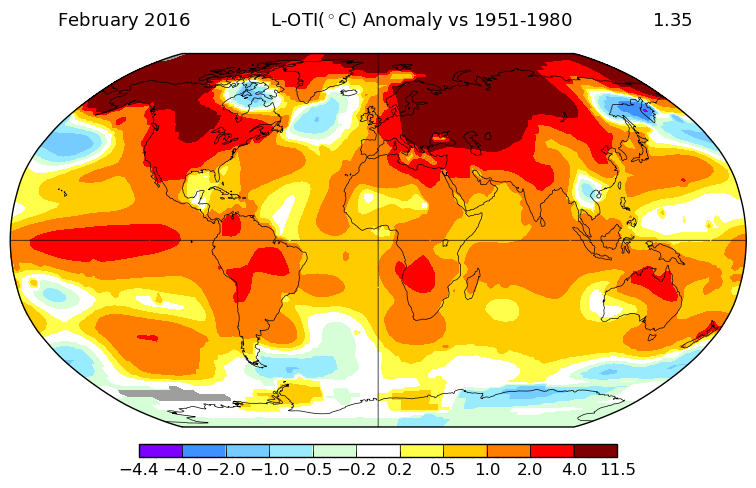 An extraordinary 1.35 °C above the 1951-1980 baseline. The Global Warming Pollutocracy Fawn Club is desperately trying to ignore the indisputable trend in the decline of Arctic sea ice. The Arctic is already responding to the incredible spike in global temperatures, and this year may yet be one that we wished we could travel back in time to prevent! The blue line is a piecewise linear fit to the adjusted data, the red line is a lowess smooth (hard to see because the blue line is on top of most of it). Again, February is high enough to be a surprise, but not a shock.